Thought I would do a quick post on what I think are the remains of 'clutter screens' for Diver battery S3 before they disappear altogether! This battery consisted of four 3.7" anti-aircraft guns. I have already mentioned 'clutter screens' on an earlier post, and suspect they were gun-laying mats, to create a false horizon or fixed datum for gun-laying radar. It was about two yrs ago these remains first appeared at Thorpeness Common due to cliff erosion. They would appear to be the base of the scaffolding support for the chicken wire; presumably when the battery site was removed at the end of the war the scaffolding just being cut off at ground level. Remains of the chicken wire can still be seen, although no sign of the metal bands and rods that I posted about in the blog on Diver site S1 (although remains of these can be found further west on the track running past the common). Not much exists in the remains of the accommodation camp - a few concrete bases for huts and the odd drain manhole. Also took some more photos of this pillbox (a Suffolk Square) at Sizewell - I am still puzzled about the odd 'arched' embrasures (right hand side in photo 5 and 6) with another two on the east side of the pillbox. As can be seen from the photo of the interior of the pillbox, the heights are also slightly different. This is the only Suffolk Square I have seen these type of embrasures in. A weeks holiday over the last week, but did not manage to get much exploring in as I concentrated on visiting the local Suffolk Record Office branches - I now have enough material to contemplate a second website - Home Guard (including HG defence schemes) and Civil Defence Schemes - a logical step really as the Second War (along with the First) involved the entire population (i.e volkskrieg - 'peoples war' as the Germans referred to it). 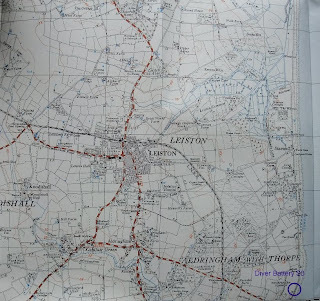 As the British Army's attention moved away from anti-invasion defence to preparations for engaging the enemy in foreign theatres of war (esp the build up to D Day) there was a need for ever increasing training and Suffolk became a major area for such training. 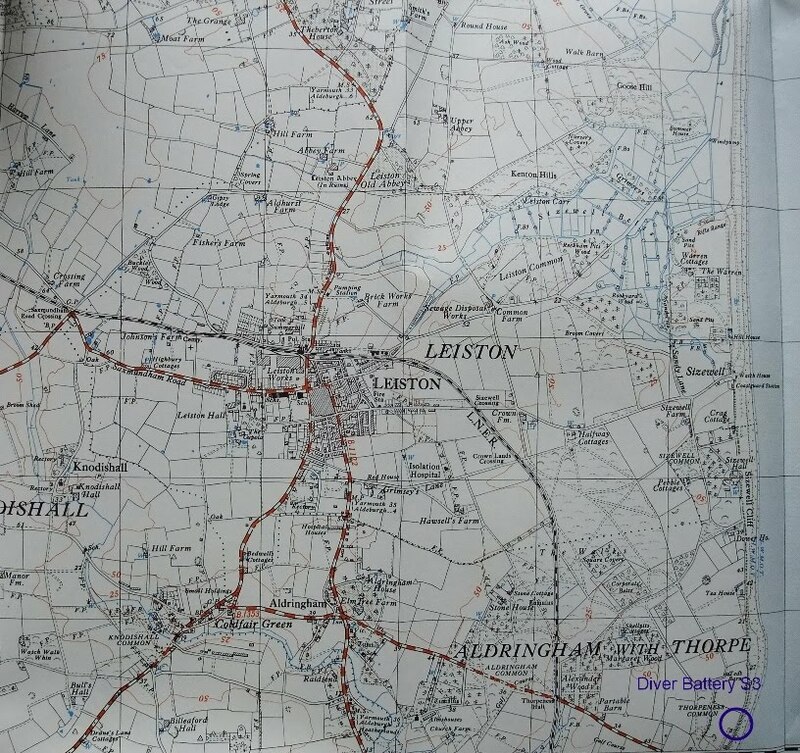 Boyton Marshes played a part in this. Here an Armoured Fighting Vehicle (AFV) range was established, part of the Orford Battle Training area. 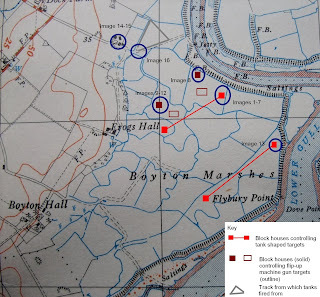 Tanks would tack around a triangular track and live fire at targets - tank shaped targets that were towed along a narrow gauged track, controlled by large block houses, both the block house and track built into substantial earth banks as shielding. Two target tracks and sets of block houses were built to provide a variation in range. Smaller block houses controlled flip up targets for the tanks machine guns. Today three of the block houses remain (although the earth banks are no longer present), all easily viewable from public rights of way but no close up access - but I had permission to visit two of them. Other remains include a destroyed concrete structure (no doubt the remains of another of the block houses), what would appear to be some of the remaining triangular track and two Romney Huts at the nearby farm yard. 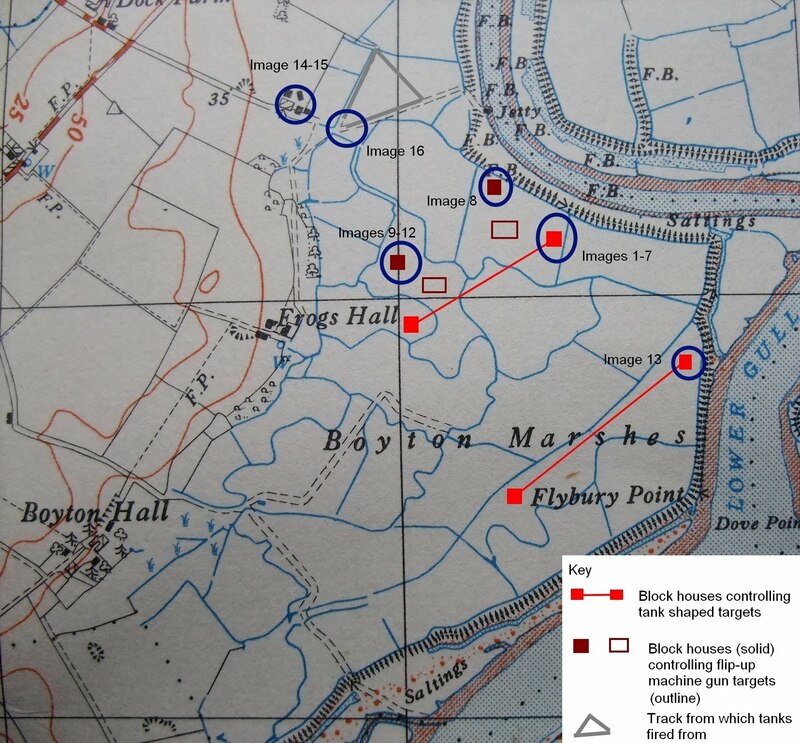 The attached map (plotted from a war time aerial photo) shows a plan of the range, with surviving structures circled in blue (two of the large block houses controlling the tank targets, one blockhouse (and the destroyed remains of the second) that controlled the flip up mg targets, part of the track which tanks fired from and two Romney Huts. Spurn Point was a key point to controlling access to Humber and as a result was given defences in both World Wars. Remains of defences at the fort that can still be seen still include pillboxes from both wars, and a 9.2 inch battery. The fort at the point was supplied by both road and small gauge railway - of which some evidence of blocks can still be seen. Have finally found out what the unidentified structure in the last post is - a concrete redoubt (Murray's Post) dating from the First War. Image 2: Massive road block which would have supported a rail slotted into two blocks with anti-tank cubes either side. No idea what the wire baskets filled with rocks are doing here! Presumably left over from some sea defence work.